Red Baron Pizza is giving away hundreds of Virtual Rewards Cards now through October 19th. 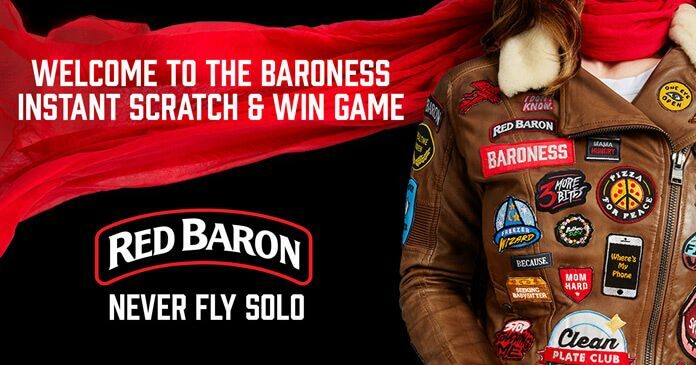 Play the Baroness Instant Scratch And Win Game at www.RedBaronBaroness.com to see if you have won a prize. The Red Baron Pizza Baroness Instant Scratch And Win Game is open only to legal United States residents residing in the 50 United States and District of Columbia who are 18 years of age or older are eligible to participate. The Entry Period begins on 9/7/17 at 12:00:00 AM ET and ends on 10/19/17 at 11:59:59 PM (ET). Limit one entry per person and per email address per day. One computer generated winning time will be randomly generated for each prize available. If you are the first participant to participate at or after one of the randomly generated times, you will be a potential winner of the prize indicated. Three (3) $25 Virtual Rewards Cards will be available each day of the Promotion Period for a total of one hundred twenty nine (129) $25 Virtual Rewards Cards available throughout the Promotion Period. Two (2) $10 Virtual Rewards Cards will be available each day of the Promotion Period for a total of eighty-six (86) $10 Virtual Rewards Cards available throughout the Promotion Period. For the names of $25 prize winners, send a self-addressed, stamped envelope by 1/10/18 to: Red Baron Pizza Baroness Instant Scratch and Win Game, Attn: Winners’ List, P.O. Box 930175, Wixom, MI 48393-0175. Winners’ list to be available after 11/10/17.